A few months ago I was having dinner with Don Fischer, a friend from my days with the Department of Education, and he asked if I'd like to join him and his wife for a tour of Turkey, and without giving it much thought I said, "Sure." Turkey, hm? Well, why not? But what did I actually know about Turkey? Istanbul, the Orient Express, From Russia with Love, Topkapi, the Bosphorus, Richard Halliburton swimming the Hellespont, Asia Minor, my college roommate Leon graduated from high school in Ankara, Paul's missionary journeys, my friend Ismail Akbay from the Marshall Space Flight Center was Turkish and he ate lots of home made yogurt, Ataturk, um ... Alexander the Great, maybe? Clearly I didn't know nearly enough about Turkey. And it sounded exotic. And it sounded educational. And I hadn't yet noticed it borders Iraq. D'oh! So I signed up for the Trafalgar tour. Click here to read the official tour site. 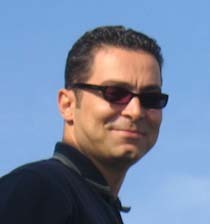 I departed for Turkey on September 22, and returned home on October 6, 2005. Here's a map of the trip. We started in Istanbul, drove south to Canakkale (Cha-KNOCK-uh-leh), further down to Izmir (formerly Smyrna), east to Pamukkale (Pah-MOOK-uh-leh), down to the Mediterranean coast at Antalya, then up to the very conservative Konya, and further up to Cappadocia (Kap-uh-DOKE-ee-uh), then back northwest to the capital city of Ankara, then west to Bursa, and finally back to Istanbul. That's about 3,400 kilometers or 2,113 miles. We spent a lot of quality time on the bus. 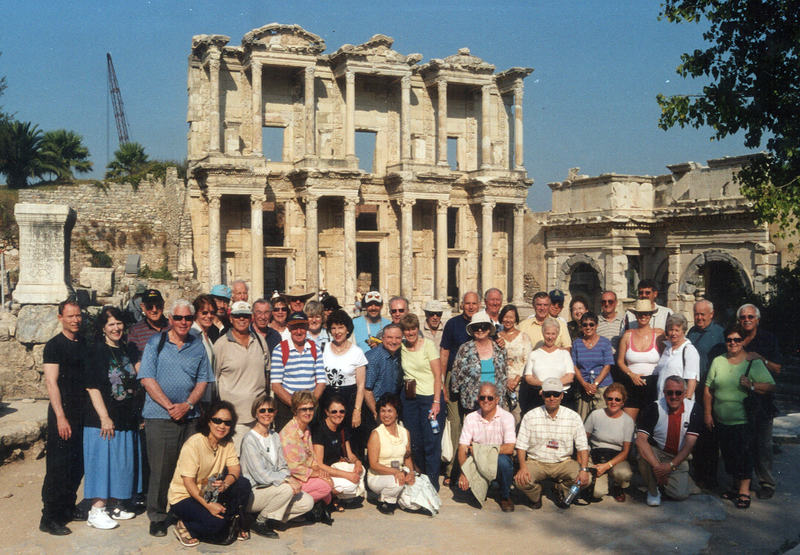 Here's our tour group, posing in the ruins of Ephesus. There were 44 of us, 46 if you count the tour guide and the bus driver. Quite a fine-looking cast of characters, don't you think? We had group members from the USA, Canada, South Africa, Australia, and New Zealand. Everybody spoke the same language, though not always the same way. By the end of the trip we had become close. Just a congenial, fun-loving bunch of good people. For a higher-res version of the group photo, click here. That fellow to the right is our tour guide, Mete Mutluay. (His name is pronounced "MET-eh.") He was an absolutely outstanding group leader -- a fount of information about Turkey, its history and customs and politics and geography and cuisine and architecture and dress and educational system and on and on and on. After traveling with Mete for two weeks, I know without question that he is a true Turkish patriot. I believe he considers his profession to be a mission -- his opportunity to help the poor, uneducated North Americans and others understand Turkey, its tremendous promise and its daunting challenges. He is an excellent spokesman for his country. He is also an accomplished, diplomatic manager of people. We never worried about getting lost or finding excellent food or locating a clean toilet or anything else -- because Mete was always there to show us the way. Any time he would give us instructions, he always concluded by saying, "You will never miss it." And he was right; we never did. Any questions about our program for today? Throughout this website I've sprinkled "Mete Says" buttons that connect to RealPlayer video of Mete's factoids about his country and its people. If you want to watch a video, be sure you have the latest version of RealPlayer installed on your computer. Hint: the Basic Player is free. The buttons below represent the places we spent each night on our trip. They're in chronological order, reading left to right. Most of them have sub-menus with pictures of the various places we visited each day. So click away, and join us on our tour of fabulous Turkey.